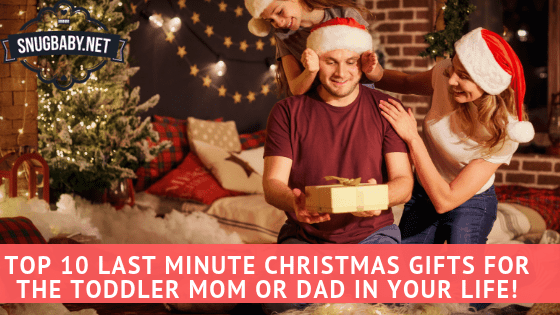 →Top 10 Last Minute Christmas Gifts For The Toddler Mom or Dad in Your Life! Christmas is almost here and looks like you need some inspirational gift ideas for young parents. We’ll get down to the list right away…without wasting time. Who reads long winded intros anyway? Some of these gifts don’t even require shipping…so they are indeed ‘last minute’. Also, the list includes gifts that cater to various budgets. So whether you want to splurge or save, we’ve got you covered. At SnugBaby, we always try to feature gifts and products that people ACTUALLY love! You absolutely cannot go wrong with these. They are deliverable by email or snail mail. (Depends on how much time you’ve got left…) There’s also an option of having an Amazon gift card delivered in a snow-flake shaped box. Works perfectly for the Christmas theme. Even if it’s a card that’s deliverable by email, it can be printed out and presented in a nice envelope. This ensures that your recipient does not miss the email. Amazon Gift cards are amazing – they may seem like a ‘safe’ choice but actually they’re appreciated by almost everyone as they give people the opportunity to select the gift of their choice. Who doesn’t like being spoilt for choice? Toddler moms and dads can use them to buy anything ranging from audio books on parenting to car seats for additional safety. Parents, especially those that have very young kids, have busy, stressful lives. I have two kids of my own and sometimes I feel like I’am walking on a tightrope while juggling knives and playing a trombone at the same time. Just like everybody else, toddler moms and dads too need their entertainment fix in order to retain their sanity. Amazon Prime Video and Netflix have some of the most enthralling movies and shows, including a a good bunch of kid and family friendly stuff. So yes, Christmas or not, they do make excellent gifts. AND – guess what – you can get them on Amazon too! Psst….you might need a little background info on whether your beneficiaries are already members. Then you can just go ahead and renew their subscriptions. Either way, the amount will be credited to their account. Kindle Unlimited is also a good option if the person likes to read a lot. It provides access to more books than he/she can read in a lifetime. Firestick and Alexa devices (echo, etc) are also ‘cool’. Toddlers moms and dads are usually below forty. So they’re at least moderately tech-savvy. These items do require shipping though. On the plus side, they’re among the fastest delivered goods on Amazon. Order now before it’s too late. This is unique and quite useful. Helps parents keep an eye on their loved ones, facilitates communication and bolsters overall security. This one, called the Nest Security Camera allows parents to access footage from anywhere and pairs with Alexa. It has motion sensors so parents get notified about everything such as: when the kids wake up or if the dog decides to take a nap on the couch. The inbuilt speaker lets parents talk with their kids, or the dog, for that matter! Often, toddlers have whimsical sleep patterns. They suddenly become very energetic and overly hyper the moment it’s time for their parents to go to bed. As a result, parents are often sleep deprived and end up at work looking like zombies. Toddler moms and dads will send you blessings galore if you gift them a Starbucks Gift Card. You can choose any amount between as low as $25 to $200. This Christmas gift can be especially useful post holiday season when people need to get back to work and find their rhythm. It’s smart and indicates that you have empathy. It gets severely cold in many parts of the world during Christmas. An electric blanket ensures a night of restful sleep. These have got a number of personalized settings and auto turn-off function. Electric blankets can be used either by the toddlers or their parents. They are completely safe and low on maintenance. An electric freaking HEATED COAT is also a good alternative. It makes commuting and supermarket visits a bit more comfortable. It’s lightweight, looks good and does actually keep the wearer nice and warm. This particular model is machine washable and comes with a one year warranty. It heats up within seconds, has loads of customization options and the certified battery lasts for approximately 10 hours. This Christmas gift does require shipping so order as soon as possible. Preferably right now. Does this toddler mom/dad/family love to travel? Vacation gift cards start at just $25 and they’re available on Amazon. Hotels.com is among the top hotel reservation websites in the US. It features hotels for every type of traveller – from backpacking hostels to family hotels and luxurious properties. AirBnb offers a more ‘local’ and authentic experience of a travel destination. Hotels.com and Airbnb gift cards can be delivered via email. Since we’re talking about travel, you might want to check out the Snugbaby’s list of the best travel system strollers in the US. Toddler moms and dads are usually quite busy and rarely find time for the gym. This is precisely why walking/treadmill desks make PHENOMENAL Christmas gifts. Yes, they are not exactly cheap and take time to ship. (They’re not as expensive as you might first think either). But all this can be discounted when you consider their life-changing impact. They allow parents to exercise while working and even while watching Netflix! So they save a lot of time. They’re more efficient and productive. Parents can work out while being with their kids. This helps them to achieve optimal work-life balance. They get a work out without really working out. This is the best kind of exercise. The mind is busy with work or entertainment and the body is getting exercised. This is totally not boring and requires very little motivation. Many people have transformed their bodies via walking desks. Check out these popular walking desks on Amazon.com. Does this toddler mom/dad have an iPad, Macbook or iPhone? If yes, then these gift cards can be used at amazon or iTunes stores or to purchase premium versions of useful apps of their choice. Prices start at just $25. The maximum amount you can gift is $200. If the person is an Android user, you can opt for a Google Play Gift Card instead. This is THE perfect Christmas gift for families with (or without) an inclination towards fitness and proper nutrition. A lot of food needs to be bought during holiday season as there are parties, guests and elaborate meals. A Whole Foods gift card can be redeemed at any store in the USA and it has no expiration date! Cool, eh? Young parents play with and carry their toddlers around. They don’t get a chance to wear expensive jewellery and accessories while interacting/playing with kids for fear of damage. These Casio G-Shock watches can take a ton of abuse and are very hard to break. They are perfect for the park, playground, camping, shopping, swimming and in almost every other casual/sporty setting. They look quite appealing and last a lifetime. Hope you enjoyed our list of the Top 10 Last Minute Christmas Gifts For Toddler Moms and Dads.